Outfielder Rusney Castillo (right), who drove in the game’s lone run, got a hand from third baseman Pablo Sandoval after the final out. The wounds of a brutal seven-game road trip were still fresh when the Red Sox returned to Fenway Park Tuesday. The rain Monday that put their series opener against the Twins on hold for a day couldn’t wash them away. Staring up the standings at all of their AL East rivals — even if only four games separated them — left everyone from the clubhouse to the front office carrying the weight of the season’s disappointment so far. And there still were more than 100 games in front of them. The Sox’ 1-0 win over the Twins was still marked by many of the issues that made May such a struggle — ineffectiveness at the plate nearly undermining a solid performance on the mound — but for a team that had just lost six of seven, it was a win. 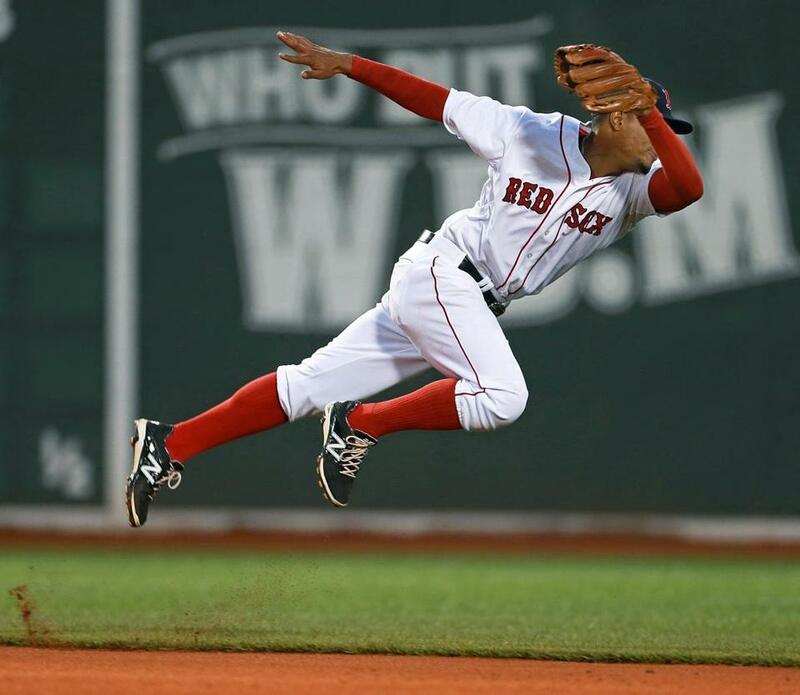 Shortstop Xander Bogaerts leaped, but couldn’t quite catch up with a ball off the bat of Twins first baseman Joe Mauer in the fourth inning. The Sox had won eight one-run games before Tuesday night, but with a doubleheader on Wednesday, Bogaerts said this one needed to be a springboard. Starving for run support most of the season, Buchholz again had little room for error. For as sharp as he was in his eight shutout innings, the lineup had to claw to muster a run for him to work with. The Sox put Twins starter Mike Pelfrey in a tight spot early but let him off the hook. In the second inning, Pablo Sandoval worked a one-out walk and Mike Napoli followed with a double off the Monster to put a pair of runners in scoring position. But Bogaerts reached for one of Pelfrey’s splitters on a 1-and-2 count and bounced it to shortstop Danny Santana, who was playing in on the grass and threw Sandoval out at the plate. Sandy Leon popped to short to end the threat. Buchholz was carving up the Twins lineup, using his fastball, cutter, and curveball. He piled up eight strikeouts and allowed just five baserunners (three hits, two walks). He was two pitches away from an immaculate inning in the fifth, when he struck out Eddie Rosario and Eduardo Escobar on three pitches apiece, then started Aaron Hicks with a first-pitch strike. He walked Hicks on six pitches, but came back and rang up Santana on four pitches to finish off the inning. Buchholz was still looking for his first win at Fenway Park this season. It wasn’t until the seventh that the Sox put him in position to get it. Bogaerts fell behind, 0-and-2, to Pelfrey, but after fouling off a slider and a sinker away, he was waiting on another offspeed pitch. “I got one the first pitch, missed it, and stayed with my approach and I got one,” Bogaerts said. When Pelfrey left a splitter over the middle of the plate, Bogaerts shot it deep to center field. As he watched it fly, he thought he finally put the Sox on the board. “I really thought I had that home run,” he said. The ball dotted the wall on the 379 sign and Bogaerts settled for a double. Leon’s five-pitch walk brought Castillo to the plate, and after Pelfrey missed low with a first-pitch sinker, then got one over for a strike, Castillo fouled off three straight pitches before taking a knee-high sinker on the inside of the plate and shooting it up the middle for the single that scored Bogaerts. 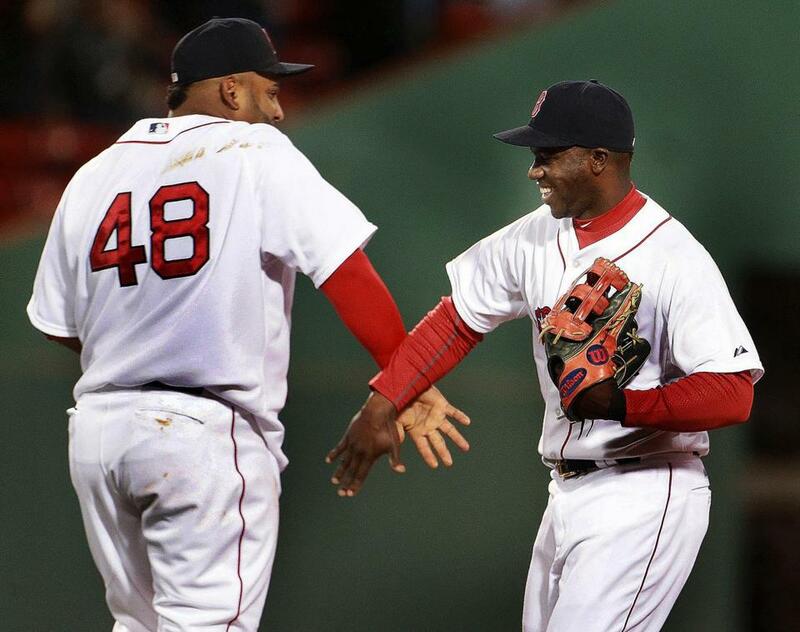 “I thought it was a good at-bat for me, especially given the situation in the game, and thankfully I was able to drive in the go-ahead run after some tough at-bats prior to,” said Castillo, with staff assistant Adrian Lorenzo interpreting. Leon was thrown out at third to end the inning, but the run counted. 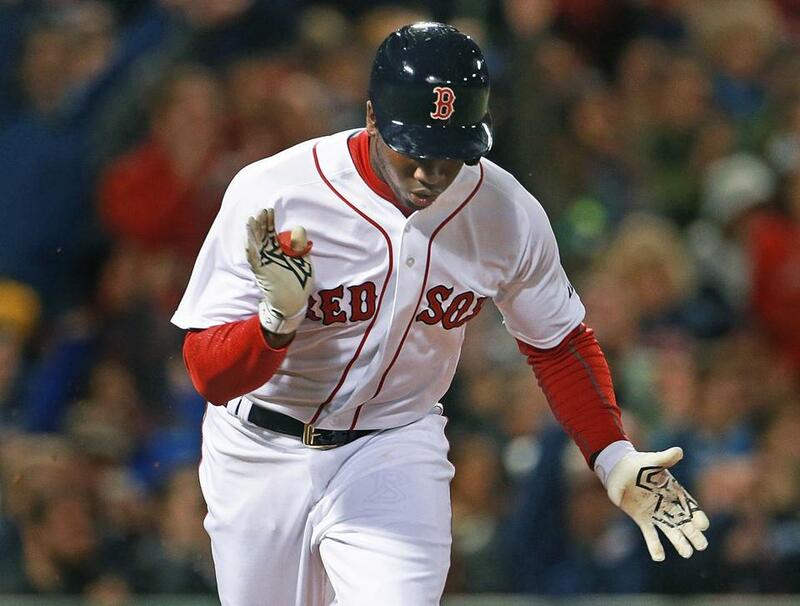 Castillo clapped after his eighth-inning hit that scored Bogaerts. A week ago, seven innings of five-hit, one-run ball was enough for Pelfrey to bottle up the Sox, but even with the Sox going just 1 for 7 with runners in scoring position Tuesday night, the one run was enough. The next step is turning around the season, a game at a time.